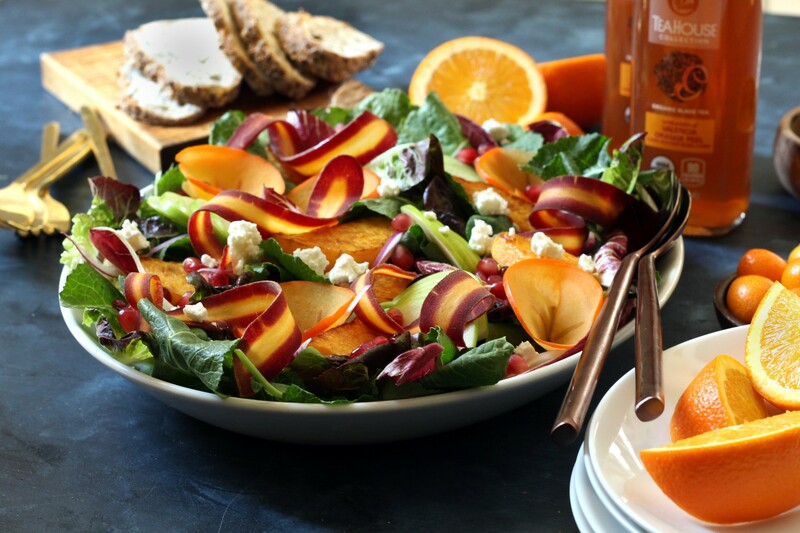 Recipe for FALL FARMERS’ MARKET SALAD with MAPLE CITRUS VINAIGRETTE first. Shopping resources, additional recipe suggestions and tips, and personal notes follow. This post generously sponsored by Pure Leaf® Tea House Collection™. Thank you for supporting the brands that keep TheDeliciousLife alive! 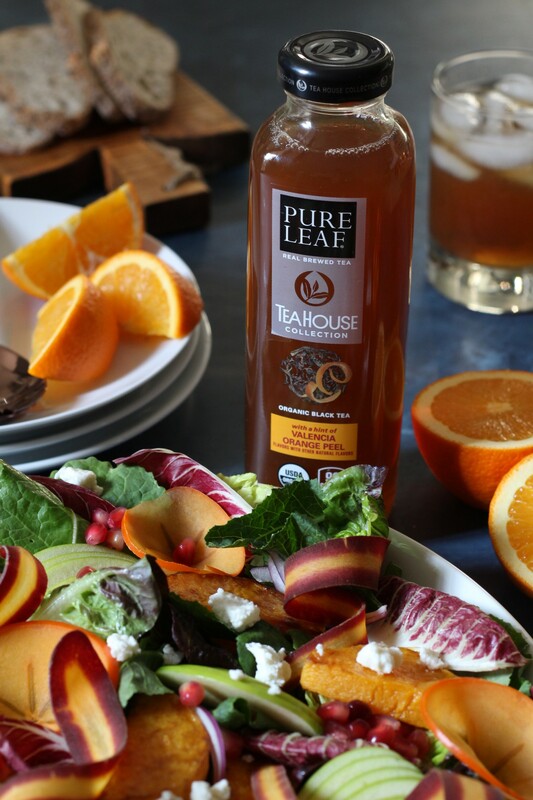 My Fall Farmers’ Market Salad with Maple Citrus Vinaigrette recipe draws inspiration from local farmers’ markets as well as the Pure Leaf® Tea House Collection™. 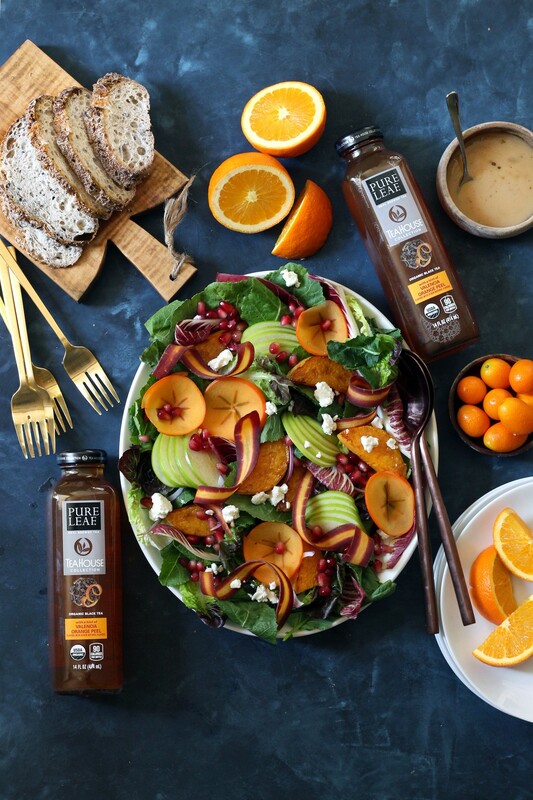 The salad ingredients are the deep green, orange, and crimson fruit and vegetables fresh at the fall markets now, and the Maple Citrus Vinaigrette picks up the sweet, layered notes of Valencia Orange Peel flavor. In a large bowl, toss baby kale, little gem lettuces, and radicchio leaves with ¼ of the Maple Citrus Vinaigrette. Place dressed greens in large salad serving bowl or platter. 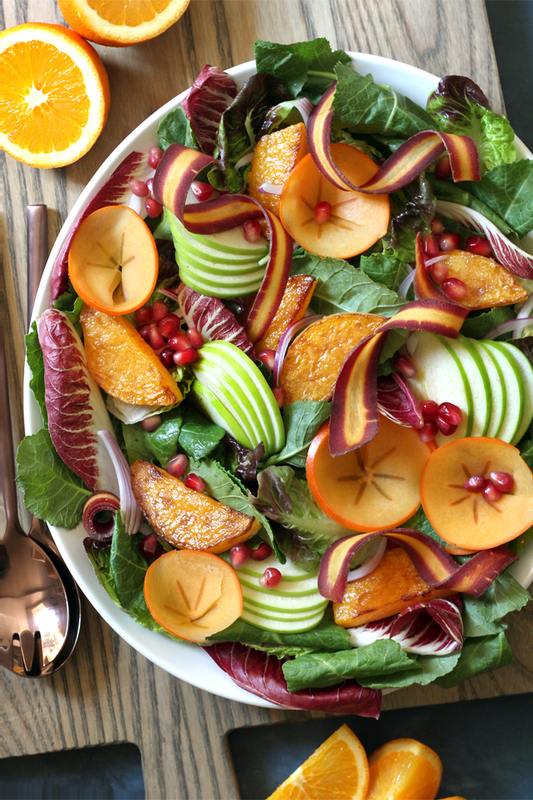 Arrange the roasted butternut squash, carrot ribbons, green apple slices, persimmon slices, and any other optional salad ingredients you might be using artfully around the greens on the serving platter. Sprinkle the salad with toasted walnuts, pomegranate seeds, pickled red onions, and crumbled feta cheese. Serve with additional Maple Citrus Vinaigrette alongside, warm crusty grilled bread with soft salty butter, and of course, iced tea. In a small mixing bowl, whisk together orange juice, lemon juice, apple cider vinegar, maple syrup, orange and lemon zests, and salt. Slowly whisk in olive oil. Season with additional salt as necessary. Any other produce that I can’t find at the farmers’ markets, I get at the grocery store. Toasted walnuts are made simply by gently stirring raw walnuts in a hot frying pan, dry, until they just start to smell toasty. Remove from pan right away (they burn very soon after that!) and let cool. You can keep toasted walnuts sealed in container in the freezer for a long while. Feta cheese from the cheese case at the grocery store. I buy the cheese as a whole brick, and crumble it myself because I like BIG crumbles (not the tiny feta dust that comes out of a plastic tub of “feta crumbles”). Apple cider vinegar: I use Bragg’s Apple Cider Vinegar. Maple syrup is off the grocery store shelf. I use organic when I can find it, and grade B (darker).